Image caption These rebranded recycling bins were removed after being placed on a supermarket car park without permission. Charities have lost hundreds of thousands of pounds after 750 clothing banks were taken from car parks, says the Textile Recycling Association. Recycling companies working with them say sometimes up to 20 a week have gone missing in the last year across England, Wales and Northern Ireland. The Charity Commission has launched an investigation. Some are run by charities such as The Salvation Army, Oxfam and the British Heart Foundation themselves, but others are operated by private recycling companies who give a donation to charities - on average £250 for every tonne of clothes collected. Around £75m was given to charities and local authorities last year. The TRA, which represents the sector, says the clothing banks have been taken from across the country - including in England's North West, the Midlands and East. It says charities receive on average £70 worth of donations a week from each bank. Because it can take between six to eight weeks to replace a bank, it is estimated charities could have lost nearly £370,000. In some cases, the recycling companies are not replacing the banks so the charities will lose out permanently. Image caption James Cook and his baby son Dexter, who died from an undiagnosed heart condition. He said: "I just can't understand why any individual would go out and take the clothing banks. "The families, they're relying on that charity to carry out a service for their child. It is a lifesaving service. "I do like to see the target go up every month, I like to see the money climb and I'm going to see it drop next month and that will hurt." Another charity which is counting the cost is Reuben's Retreat in Glossop, which provides support to families who have lost a child or have children with life-limiting illnesses. Image caption The Reuben's Retreat charity is named after Reuben Graham who died from a brain tumour. 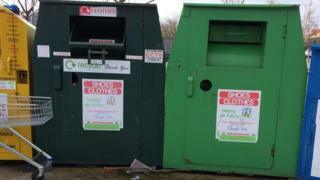 It receives donations from a recycling company, but the amount it receives has now been reduced after a number of clothing banks were taken. Nicola Graham - who founded the charity after the death of her son Reuben - said: "It will have a significant impact on our funding stream. "Reuben's little photograph is on that bin, and all our details. "It just beggars belief that somebody can think that it's OK to take from charity and actually take something with his little face on it." The TRA say the cost of replacing a bank can be up to £1,500 and the total bill to its members could be as much as £1m. President Ian Woods said the loss of the banks was "depriving members of the public from a service intended for them to recycle textiles and, more importantly, depriving charities and local authorities nationwide of revenue streams which are vitally important for the services they deliver". He added: "We are appealing to the police and other government agencies to join us in the campaign to clamp down on all forms of illegal activity connected to textile recycling." Investigators working for the TRA have removed around 200 banks which they say have been rebranded with the logo of a registered charity called Helping Our Future and placed on supermarket car parks without authorisation. The charity, which is based in Wolverhampton, says it raised nearly £19,000 last year and works to promote recycling and relieve financial hardship. BBC 5 live Investigates has discovered Helping our Future is under investigation by the Charity Commission. A spokesperson said: "The commission is examining the charity Helping Our Future as part of a regulatory compliance case. "We have serious concerns about its management and activities, and are examining trustees' oversight of the charity, its relationship with third parties, including commercial fundraising companies, and whether the charity's management and operations have given rise to inappropriate benefit on the part of private individuals or companies." The charity, which the BBC understands leases its banks from a third party, denies any wrongdoing. A company which says it acts for Helping Our Future told the BBC: "We are an associated contractor to HOF Trading Limited which is the logistical partner to Helping our Future Charity. "We are contracted to abide by a written protocol which prevents us from carrying out any criminal activity and bringing any holistic partner into disrepute." The company added that some of the charity's own banks had been taken and that this had been reported to the police. 5 live Investigates is on BBC Radio 5 live, 18 March at 11:00 GMT - catch up on BBC iPlayer Radio.